This article is about the American city. For other uses, see Grand Forks (disambiguation). Located on the western banks of the north-flowing Red River of the North, in a flat region known as the Red River Valley, the city is prone to flooding. The Red River Flood of 1997 devastated the city. Originally called Les Grandes Fourches by French fur traders from Canada, who had long worked and lived in the region, steamboat captain Alexander Griggs platted a community after being forced to winter there. The Grand Forks post office was established in 1870, and the town was incorporated on February 22, 1881. The city was named for its location at the fork of the Red River and the Red Lake River. Historically dependent on local agriculture, the city's economy now encompasses higher education, defense, health care, manufacturing, food processing, and scientific research. Grand Forks is served by Grand Forks International Airport and Grand Forks Air Force Base. The city's University of North Dakota is the oldest institution of higher education in the state. The Alerus Center and Ralph Engelstad Arena host athletic and other events, while the Empire Arts Center and Chester Fritz Auditorium are the city's largest cultural venues. Prior to settlement by Europeans, the area where the city developed, at the forks of the Red River and Red Lake River, for thousands of years had been an important meeting and trading point for Native Americans. Early French explorers, fur trappers, and traders called the area Les Grandes Fourches, meaning "The Grand Forks". By the 1740s, French fur trappers relied on Les Grandes Fourches as an important trading post. This was French colonial territory. The United States acquired the territory from British Rupert's Land with the Treaty of 1818, but indigenous tribes dominated the area until the late 19th century. After years of warfare, the United States made treaties to extinguish the land claims of the Ojibwe and other Native American peoples. When a U.S. post office was established on the site on June 15, 1870, the name was changed to the English "Grand Forks". Alexander Griggs, a steamboat captain, is regarded as "The Father of Grand Forks". Griggs' steamboat froze in the Red River on a voyage in late 1870, forcing the captain and his crew to spend the winter camping at Grand Forks. Griggs platted a community in 1875, and Grand Forks was officially incorporated on February 22, 1881. Thousands of settlers were attracted to the Dakota Territory in the 1870s and 1880s for its cheap land, and the population began to rise. Many established small family farms, but some investors bought thousands of acres for bonanza farms, where they supervised the cultivation and harvesting of wheat as a commodity crop. The city grew quickly after the arrival of the Great Northern Railway in 1880 and the Northern Pacific Railway in 1887. In 1883, the University of North Dakota was established, six years before North Dakota was admitted as an independent state born from the Dakota Territory. During the first half of the 20th century, new residential neighborhoods were developed south and west of downtown Grand Forks. In the 1920s, the state-owned North Dakota Mill and Elevator was constructed on the city's north side. In 1954, Grand Forks was chosen as the site for an Air Force base. Grand Forks Air Force Base brought thousands of new jobs and residents to the community. The military base and the University of North Dakota became integral to the city's economy. With construction of federal highways, during the postwar years residential and business development became suburbanized, spreading to new areas as land was available. Interstate 29 was built on the western side of the city, and two enclosed shopping malls – South Forks Plaza and Columbia Mall – were built on the south side. The Red River had a history of seasonal flooding, aggravated by the broad ancient lake bed that formed the Red River Valley. The 1997 Red River Flood caused extensive damage in the city. Fargo was upstream from the bulk of the flood waters that season, and Winnipeg had built an extensive system of flood control structures in the 1960s. In 1997, Grand Forks suffered the most damage of any major city in the Red River Valley. During the height of the flooding, a major fire destroyed 11 buildings in the downtown area. The government began developing a new levee system to protect the city, which was completed 10 years later. It required the relocation of numerous residents, as some neighborhoods were emptied for this construction. The city and government decided to change the type of development allowed near the river. The floodplain bordering the Red River was converted into a large park known as the Greater Grand Forks Greenway. This provided new recreation space for city residents, as well as space for future floodwaters to be absorbed naturally by trees and other plants, without damage to infrastructure. East Grand Forks developed a related greenway park on its side of the river, as it has also suffered extensive flooding that year. Since the 1997 flood, public and private developments have been constructed throughout Grand Forks. Two new, large sports venues opened in 2001: the Alerus Center and the Ralph Engelstad Arena. In 2007, the Winnipeg-based Canad Inns hotel chain opened a 13-story hotel and waterpark next to the Alerus Center. By 2007 Grand Forks had a larger population than it did before the 1997 flood. Area employment and taxable sales had also surpassed pre-flood levels. Grand Forks is 74 miles (119 km) north of the Fargo-Moorhead area and 145 miles (233 km) south of Winnipeg, Manitoba. 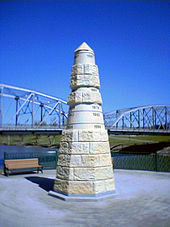 Grand Forks is on the western bank of the Red River of the North in an area known as the Red River Valley. 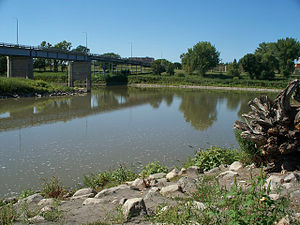 The term "forks" refers to the forking of the Red River with the Red Lake River near downtown Grand Forks. According to the United States Census Bureau, the city has a total area of 20.09 square miles (52.03 km2), of which, 19.91 square miles (51.57 km2) is land and 0.18 square miles (0.47 km2) is water. Since it is in one of the flattest parts of the world, the city has few differences in elevation. There are no lakes within the city limits of Grand Forks, but the meandering Red River and the English Coulee flow through the community and provide some break in the terrain. The Red River Valley is the result of an ancient glacier carving its way south during the last ice age. Once the glacier receded, it formed a glacial lake called Lake Agassiz. The valley is formed from the ancient lake bed. The ancient beaches can still be seen as rolling hills west of the city. Grand Forks has several distinct neighborhoods. The area adjacent to the Red River developed first; this is where some of the oldest neighborhoods, including the downtown area, can be found. The area between downtown and the University of North Dakota campus was another early growth area, and historic properties can be found here, as well. Downtown Grand Forks contains many recognized historic buildings. It is the governmental center of the city and county. It is also used as a gathering place for large community events and festivals. A farmer's market takes place every Saturday from mid-June to mid-September in the Town Square at the corner of 3rd Street S. and DeMers Avenue. In 2006, city leaders and developers announced plans to convert older office buildings into high-end condos and apartments, and to construct new buildings for the same purpose to provide for residents downtown. Directly south of downtown, the streets of the Near Southside Historic District are lined with classic houses. Reeves Drive was once one of the city's most fashionable neighborhoods. It has many historic mansions exhibiting several unique architectural styles. This neighborhood has areas of original granitoid paving, several historic churches, and Lincoln Drive Park. The Near Southside neighborhood has been designated as a "national historic district" and is listed on the National Register of Historic Places. The newer neighborhoods of Grand Forks developed in the city's southern and western parts. The 32nd Avenue South corridor has been the commercial center of the city since 1978, when the Columbia Mall opened. Many big box stores and restaurants are now along the avenue. A large strip mall, called the Grand Forks Marketplace, opened in 2001 near the Columbia Mall. University Village is a new commercial district built on vacant lands owned by the University of North Dakota. The centerpiece of the Village is the Ralph Engelstad Arena, used by the university's North Dakota men's ice hockey team. All the buildings in the village have been built in a style similar style to those on the nearby UND campus. Restaurants and retail stores, as well as the university bookstore, were developed in the area to stimulate community life. In 2006, the university opened a new wellness center for its students on the village's west side. Due to its location in the Great Plains and its distance from both mountains and oceans, Grand Forks has a humid continental climate (Köppen Dfb), USDA Plant Hardiness Zone 4a. It has four very distinct seasons and great variation in temperatures over very short periods of time. As no nearby mountain ranges or bodies of water ameliorate the climatic conditions, Grand Forks lies exposed to numerous weather systems, including bitterly cold Arctic high pressure systems. The city has long, cold, and snowy winters. Summers are often warm to hot and often quite humid with frequent thunderstorms. Although warm weather normally ends soon after Labor Day, a few warm days sometimes occur as late as October. Spring and autumn are short and highly variable seasons. Record temperature extremes range from −43 °F (−42 °C) on January 11, 1912, to 109 °F (43 °C) on July 12, 1936. The daily mean temperatures of the Grand Forks winters are associated with subarctic climates with frequent subzero temperatures. Due to the extended warm period of daily means above 50 °F (10 °C) from May to September, the city's climate is still classified within the humid continental temperature range. As of the census of 2010, there were 52,838 people, 22,260 households, and 11,275 families in the city. The population density was 2,653.8 inhabitants per square mile (1,024.6/km2). There were 23,449 housing units at an average density of 1,177.7 per square mile (454.7/km2). The racial makeup of the city was 89.7% White, 2.0% African American, 2.9% Native American, 2.2% Asian, 0.7% from other races, and 2.5% from two or more races. Hispanic or Latino of any race were 2.8% of the population. There were 22,260 households of which 24.3% had children under the age of 18 living with them, 37.3% were married couples living together, 9.7% had a female householder with no husband present, 3.7% had a male householder with no wife present, and 49.3% were non-families. 34.8% of all households were made up of individuals and 8.6% had someone living alone who was 65 years of age or older. The average household size was 2.21 and the average family size was 2.87. The median age in the city was 28.4 years. 18.4% of residents were under the age of 18; 24.6% were between the ages of 18 and 24; 25.1% were from 25 to 44; 21.7% were from 45 to 64; and 10.1% were 65 years of age or older. The gender makeup of the city was 51.2% male and 48.8% female. As of the 2000 Census, there were 49,321 people, 19,677 households, and 11,058 families residing in the city. The population density was 2,563.0 per square mile (989.8/km2). There were 20,838 housing units at an average density of 1,082.8 per square mile (418.2/km2). The city's racial makeup was 93.4% White, 0.9% African American, 2.8% Native American, 1.0% Asian, 0.1% Pacific Islander, 0.6% from other races, and 1.4% from two or more races. Hispanic or Latino of any race were 1.9% of the population. The top six ancestry groups were Norwegian (36.4%), German (34.7%), Irish (10.6%), French (6.5%), Polish (6.2%), English (6.1%). There were 21.4% of the population under the age of 18, 22.9% from 18 to 24, 27.7% from 25 to 44, 18.3% from 45 to 64, and 9.8% who were 65 years of age or older. The median age was 28 years. For every 100 females, there were 102.0 males. For every 100 females age 18 and over, there were 100.2 males. Of the 19,677 households, 28.7% had children under the age of 18 living with them, 43.2% were married couples living together, 10.0% had a female householder with no husband present, and 43.8% were non-families. 31.4% of all households were made up of individuals and 8.5% had someone living alone who was 65 years of age or older. The average household size was 2.3 and the average family size was 3.0. The median income for a household in the city was $34,194, and the median income for a family was $47,491. Males had a median income of $30,703 versus $21,573 for females. The per capita income for the city was $18,395. About 9.3% of families and 14.6% of the population were below the poverty line, including 14.6% of those under age 18 and 7.7% of those age 65 or over. The median household income was $34,194, and the median family income was $47,491. Males had a median income of $30,703 versus $21,573 for females. The city's per capita income was $18,395. About 9.3% of families and 14.6% of the population were below the poverty line, including 14.6% of those under age 18 and 7.7% of those age 65 or over. The economy of Grand Forks is not dominated by any one industry or sector. While agriculture continues to play a role in the area's economy, the city of Grand Forks now has a relatively diverse economy that includes public and private employers in sectors such as education, defense, health care, manufacturing, and food processing. The state and federal governments are two of the largest employers in the Grand Forks area. The University of North Dakota, in the heart of the city, is the largest employer in the metropolitan area. Grand Forks Air Force Base, just west of the city, employs a large number of civilian workers in addition to its military personnel. Altru Health System is the largest private employer in Grand Forks. Employees at LM Glasfiber work on a blade for a wind turbine. Major manufacturers in Grand Forks include wind turbine manufacturer LM Glasfiber and light aircraft manufacturer Cirrus Design. Major food producers include potato processor J. R. Simplot Company and the state-owned North Dakota Mill and Elevator which is the largest flour mill in the United States. Amazon.com and SEI Information Technologies both operate call centers in Grand Forks. Other large private employers in the city include the locally owned Alerus Financial branch of banks, Home of Economy, and the locally owned Hugo's chain of supermarkets. The retail and service sector is also an important part of the economy. The historic center of shopping in Grand Forks was the downtown area. Today, downtown is home to small shops and restaurants and south Grand Forks has become the major retail district in the city. Grand Forks has three large shopping centers. The oldest, Grand Cities Mall, is on South Washington Street and contains mainly small, locally owned stores as well as a Kmart. With about 80 stores, the area's largest indoor mall is Columbia Mall which is anchored by Scheels, Sears, J.C. Penney, and a small food court. The newest major shopping center in the city is the Grand Forks Marketplace power center mall which features SuperTarget, Best Buy, Lowe's, Gordmans, and several smaller stores. Depending on the relative strength of the Canadian dollar versus the American dollar, the Greater Grand Forks area attracts large numbers of tourist shoppers from Manitoba and especially from Winnipeg. The city government is involved in the economic development process, helping firms grow and attracting new firms. A portion of sales tax revenues is set aside for this, some going into the Grand Forks Growth Fund. Companies can request low-interest loans or grants from this fund provided they meet certain criteria, such as paying a relatively high wage and doing most of their business outside the city's trade region. The city also contributes to the Grand Forks Region Economic Development Corporation (EDC), a public-private organization that receives funding from banks and other major businesses. The EDC plays a consulting role for businesses, such as identifying suitable sites for expansion or assembling public funding packages. Its other key role is to vet businesses to see if they are suitable for funding by the Growth Fund. Community leaders have long seen UND as an "economic engine" for the city. Besides its regular faculty, it also has business-like components such as the Energy and Environmental Research Center. UND hosts a technology incubator called the Center for Innovation. More recently, the University has been working to commercialize its research. A major thrust in that direction is the construction of a research park on the western fringes of the campus. Another potential economic opportunity for the city is the addition of the unmanned aerial vehicle (UAV) mission to Grand Forks Air Force Base. Due at least in part to the presence of the University of North Dakota, Grand Forks offers a variety of arts and cultural events. The North Dakota Museum of Art, on the UND campus, brings many nationally touring exhibits to Grand Forks as well as the work of regional artists. In addition to the Museum of Art, UND offers other gallery space for student art. UND also has Theater Arts and Music departments. Students stage theater productions each year at the Burtness Theater on campus. UND's Chester Fritz Auditorium also brings music and theater events to Grand Forks, including national touring companies of Broadway musicals. The Greater Grand Forks Symphony Orchestra has been performing since 1905 and the Grand Forks Master Chorale was formed in 1983. Both groups stage productions each year at various locations in the community. The North Dakota Ballet Company is headquartered in Grand Forks and often performs at the Chester Fritz Auditorium. The Grand Forks City Band was formed in 1886 and still stages shows year round. The Empire Arts Center, in downtown Grand Forks, is home to several cultural events throughout the year. The Empire, a 1919 movie theater, was restored after the Flood of 1997 and now includes performance space, a large movie screen, a gallery, and space for artists. The Fire Hall Theatre, also downtown, is used by community members to put on several theater productions each year. The Summer Performing Arts Company (SPA) is a popular summer arts program for area K-12 students. SPA stages three major musicals mid-July. The Myra Museum, on Belmont Road near the Greater Grand Forks Greenway, is a small history museum with exhibits that trace local history from the Ice Age, through settlement, and into the modern age. Other buildings on the Myra Museum grounds include the original 1868 Grand Forks Post Office, a 1917 one room school, and the historic Campbell House. College sports are popular in Grand Forks, with an intense following for the University of North Dakota. The UND men's ice hockey team competes in the NCAA Division I level and has been the Frozen Four championship team eight times and the runner-up five times. The UND football team was the 2001 NCAA Division II champion and the 2003 runner-up. In 2006, the university announced that it would be moving its entire athletic program to Division I. Grand Forks is home to two major indoor athletic arenas. The city-owned Alerus Center opened in 2001. The Alerus Center is home to the University of North Dakota football team and also plays host to a variety of other events including major concerts. The Alerus Center is the largest arena and convention center complex in the upper Midwest area. The University of North Dakota hockey teams compete in the Ralph Engelstad Arena, in the University Village district of the UND campus. "The Ralph", as it is commonly called, was funded by UND benefactor Ralph Engelstad and opened in 2001 at a cost of over $100 million. Adjacent to the Ralph Engelstad Arena is the smaller Betty Engelstad Sioux Center. "The Betty" is the home of the University of North Dakota basketball and volleyball teams. The Grand Forks Park District, established in 1905, operates 14 neighborhood parks, 28 tennis courts, 2 swimming pools, and 3 splash parks. The parks include features such as playgrounds, baseball fields, softball fields, soccer fields, basketball courts, tennis courts, and picnic areas. Sertoma Park includes a Japanese garden. The Park District also operates eleven outdoor skating rinks and indoor ice arenas: Purpur Arena, Eagles Arena, Blueline Club Arena, and Gambucci Arena. The district also owns the Choice Health & Fitness. There are several golf courses in the city and the surrounding area. The Park District operates the 18-hole, Arnold Palmer-designed, links style King's Walk Golf Course and the historic, 9-hole Lincoln Golf Course. The University of North Dakota operated the 9-hole Ray Richards Golf Course. However were forced to sell the course in 2016 leaving it abandoned. The 18-hole Grand Forks Country Club is directly south of the city. There are also golf courses in nearby East Grand Forks, Minnesota and Manvel, North Dakota. The Grand Forks Herald is the major daily newspaper serving Grand Forks and the second most widely circulated newspaper in North Dakota with a daily circulation of around 31,000. The Exponent is a weekly newspaper published in East Grand Forks, Minnesota. The University of North Dakota also has its own student-published newspaper called The Dakota Student, which is published twice weekly during the school year. The major AM radio station in Grand Forks is KNOX 1310, which is a news and talk station. The city's FM stations include NPR affiliates KUND-FM 89.3, KFJM 90.7, KQMN 91.5 and KNTN 102.7. Commercial FM stations include rock station KJKJ 107.5; top 40 stations KKXL-FM 92.9 and KZGF 94.7; and country stations KSNR 100.3 and KYCK 97.1. WDAZ-TV channel 8, an ABC affiliate, is the only broadcast television station in Grand Forks that provides local news. All other major U.S. television networks are broadcast from Fargo. Grand Forks uses the mayor-council model of municipal government. The mayor, who is elected every four years, has the power to oversee the daily administration of city government and to work directly with department heads to ensure the proper provision of services. The mayor of Grand Forks is obstetrician Dr. Michael Brown. He was first elected in 2000 and was re-elected in 2004, 2008, 2012 and again in 2016. The city is divided into seven wards with each ward electing a single city council representative for a four-year term. The council meets twice a month as the council proper and its two main committees, the Finance/Development Committee and Service/Safety Committee, each meets twice a month. All these meetings are broadcast on a local cable channel. The University of North Dakota (UND), the oldest university and home of the only schools of medicine and law in the state, is at Grand Forks. UND is known for its John D. Odegard School of Aerospace Sciences which includes an Air Traffic Control Training program that in October 2009 was ranked No.1 in the nation for the second consecutive year by the FAA. UND and North Dakota State University make up the Red River Valley Research Corridor. Northland Community and Technical College, a two-year school, is across the Red River in East Grand Forks. The University of Minnesota Crookston is in nearby Crookston, Minnesota. The Grand Forks Public Schools system includes the Grand Forks and Grand Forks Air Force Base school districts. Enrollment is about 7,600. There are twelve elementary schools, four middle schools, (Schroeder, South, Valley, and Twining) and two high schools (Central High and Red River High), an alternative high school, and an adult education program. Grand Forks Public Schools is governed by a nine-member board of elected representatives, separate from the city and county governments. There are several primary schools that are not part of the public school system including the state-operated North Dakota School for the Blind. There are two Catholic schools offering classes from kindergarten through sixth grade. The only private high school in the metropolitan area is Sacred Heart High School, a Catholic school, in East Grand Forks. There is a non-denominational Christian elementary and middle school operating in East Grand Forks. Grand Forks International Airport (GFK, KGFK) is served by Delta Air Lines with several daily round trips to Minneapolis-St. Paul International Airport; and Allegiant Air, which operates flights a few times a week to Mesa, Arizona (Phoenix-Gateway), Sanford, Florida (Orlando-Sanford) and Las Vegas, Nevada. A new passenger terminal completed in early 2011, allowed more passengers to come through the airport, improved circulation, added a baggage claim and addressed security and safety concerns. The airport was a major distribution center for FedEx, which conducts flights daily within the state and northern Minnesota. FedEx moved their flight operations to Fargo, ND on October 31, 2016. The airport is one of the busiest airports in the country, due in large measure to the presence of the John D. Odegard School of Aerospace Sciences of the University of North Dakota. The BNSF Railway runs track in several directions in and around the city. Amtrak passenger service on the Empire Builder line heads westbound daily at 4:52 am and eastbound daily at 12:57 am. The Empire Builder stops at the Grand Forks Amtrak station. Three federal highways pass through Grand Forks: U.S. Route 2, Interstate 29, and U.S. Highway 81. U.S. Highway 2, known as Gateway Drive in the city, runs east to west through the northern part of town and is a four-lane highway. The highway is the primary connection between Grand Forks, East Grand Forks, the Grand Forks Air Force Base, Grand Forks International Airport, and nearby Crookston, Minnesota. Interstate 29 runs north to south along the western part of the city, officially multiplexed with U.S. Highway 81 in the Grand Forks area. The U.S. Highway 81 business route, Washington Street and 32nd Avenue, runs through many of the city's major commercial districts. Within the city, roads that run from north to south are traditionally called "streets" and roads that run from east to west are traditionally called "avenues". Streets are numbered in blocks west of the Red River. Avenues are numbered in blocks north or south of DeMers Avenue – the city's historic dividing route adjacent to the rail yards. The city maintains a bus system called Cities Area Transit, also known by the acronym CAT. The system has operated since 1926 when it was introduced to replace an earlier trolley system. There are twelve bus routes including night service and service in the community of East Grand Forks. With over 4,100 employees and nearly 300 physicians and mid-levels (nurse practitioners and physician assistants), Altru Health System is the main provider of health care in Greater Grand Forks and the surrounding region. Serving more than 220,000 residents in northeast North Dakota and northwest Minnesota, Altru provides an array of services to meet the needs of patients of all ages and levels of health. As the first member of the Mayo Clinic Care Network, Altru's providers have access to clinically integrated tools extending Mayo Clinic's knowledge and expertise to patients. Altru Health System is also the largest private employer in Grand Forks. Offering all private patient rooms, Altru's Columbia Road Campus includes Altru Hospital (257 beds), Altru Rehabilitation Center (20 beds) and multiple clinics. Altru's South Washington Medical Park features Altru Specialty Center (45 beds), Altru Professional Center and Yorhom Medical Essentials. The Sanny and Jerry Ryan Center for Prevention and Genetics, housed in Choice Health & Fitness, encourages individuals to think about their health through preventive measures before it becomes medically necessary to seek care. The first of its kind in the region, the Center provides a unique opportunity for individuals to take an active approach to a healthier life. Truyu Aesthetic Center, with locations in Grand Forks, East Grand Forks and across the region, offers surgical and non-surgical procedures, services and products under the support of Altru. Altru Health System is the result of a 1997 merger of United Hospital (formerly Deaconess and St. Michael's Hospitals) and the Grand Forks Clinic. Grand Forks is also home to several long-term care facilities, serving many of the area's elderly, . The Valley Memorial Homes, St. Anne's, Edgewood Parkwood Place, and Maple View Memory Care. Grand Forks has an active sister city program designed to encourage cultural and economic exchanges. Grand Forks' first sister city was Ishim in the Soviet Union. The relationship with the Siberian city formally began in 1984 during the Cold War. Sometime in the late 1990s, however, political and economic turmoil in Russia ended the relationship. While the relationship with Ishim faded, Grand Forks found a new sister in Awano, Japan. An informal relationship began in 1994 when the school districts of both cities began exchanging students. In 1998, the two formally proclaimed themselves sister cities. The most concrete evidence of the relationship between the two is a Japanese rock garden in Grand Forks' Sertoma Park and a sculpture of an American bison in an Awano park. However, the annexation of Awano by the larger city of Kanuma has led to the end of the sister city relationship. Grand Forks' relationship with Dickinson, North Dakota, began in 2002, when delegations from each city visited the other. Grand Forks Mayor Michael Brown has said he thinks having friends in western North Dakota, which typically has diverging interests from eastern cities, could help at the state legislature. Sarpsborg, Norway, became a sister city in 2005 following several exchanges among leaders from both cities. The city became interested in building a relationship with Sarpsborg because many Grand Forks residents have Norwegian heritage. ^ a b "Red River of the North – State Canoe Routes". Minnesota Department of Natural Resources. Retrieved June 5, 2007. ^ "The Grand Forks Flood". Draves.com. Retrieved June 5, 2007. ^ a b c d e f g "Grand Forks History". City of Grand Forks, North Dakota. Archived from the original on June 6, 2007. Retrieved June 5, 2007. ^ a b "Community of Grand Forks". University of North Dakota. Retrieved June 11, 2007. ^ a b c d e "Grand Forks' 50 Largest Employers" (PDF). State of North Dakota. Archived from the original (PDF) on November 9, 2006. Retrieved June 5, 2007. ^ a b c d e f "About UND". University of North Dakota. Retrieved June 5, 2007. ^ a b c "History of Alerus Center". Alerus Center. Retrieved June 5, 2007. ^ a b c "History of Ralph Engelstad Arena". Ralph Engelstad Arena. Archived from the original on May 1, 2007. Retrieved June 8, 2007. ^ a b "Chester Fritz Auditorium". Chester Fritz Auditorium. Retrieved June 11, 2007. ^ "Dakota Datebook, October 20, 2003: Griggs and Grand Forks". North Dakota Public Radio. Archived from the original on September 30, 2007. Retrieved June 8, 2007. ^ "Historic Grand Forks". Grand Forks County Historical Society. Archived from the original on July 9, 2007. Retrieved June 8, 2007. ^ "History". North Dakota Mill and Elevator. Retrieved June 8, 2007. ^ "History of the Grand Forks Air Force Base" (PDF). Archived from the original (PDF) on March 19, 2006. Retrieved June 5, 2007. ^ "Grand Forks, Mayor's Office". University of North Dakota. Archived from the original on December 19, 2007. Retrieved June 5, 2007. ^ "Grand Forks". Canad Inns. Archived from the original on June 1, 2007. Retrieved June 5, 2007. ^ "High and dry". Federal Reserve Bank of Minneapolis. Archived from the original on December 20, 2007. Retrieved June 8, 2007. ^ "Grand Forks, North Dakota (ND) Detailed Profile". City-Data.com. Retrieved June 5, 2007. ^ "Travel to Grand Forks, ND and East Grand Forks, MN". Greater Grand Forks Convention & Visitors Bureau. Archived from the original on May 30, 2007. Retrieved June 5, 2007. ^ "Campus landmarks". University of North Dakota. Retrieved June 8, 2007. ^ "The Red River Valley: Tilted Shorelines and Rebounding Lake Beds". University of North Dakota. Archived from the original on December 8, 2006. Retrieved June 8, 2007. ^ "National Register of Historic Places" (PDF). City of Grand Forks, North Dakota. Archived from the original (PDF) on October 14, 2013. Retrieved December 24, 2005. ^ "Family Fun". Greater Grand Forks Convention & Visitors Bureau. Archived from the original on May 30, 2007. Retrieved June 5, 2007. ^ Tran, Tu-Uyen (August 11, 2006). "DOWNTOWN GRAND FORKS: Apartment construction to start in October". Grand Forks Herald. ^ a b "Grand Forks County – Historic Districts". National Register of Historic Places. Retrieved June 8, 2007. ^ "Reeves Drive". Draves.com. Retrieved June 5, 2007. ^ a b c "Shopping Destinations in Grand Forks, ND and East Grand Forks, MN". Greater Grand Forks Convention & Visitors Bureau. Archived from the original on May 30, 2007. Retrieved June 5, 2007. ^ LeAnna Anderson (September 28, 2000). "UND's New Neighborhood". University of North Dakota. Archived from the original on August 7, 2007. Retrieved June 11, 2007. ^ "Wellness Center". University of North Dakota. Retrieved June 8, 2007. ^ USDA Plant Hardiness Zone Map (Map). United States Department of Agriculture. Archived from the original on February 27, 2014. Retrieved May 10, 2013. ^ "THE GRAND FORKS UNIV. (NWS) CLIMATE SUMMARY FOR THE YEAR OF 2011". National Weather Service. Retrieved October 30, 2012. ^ "Grand Forks North Dakota Temperature Averages". Weatherbase. Retrieved January 29, 2015. ^ Records for Grand Forks have been kept at the Grand Forks International Airport since April 1965, the former Grand Forks Municipal Airport from September 1948 through March 1965, and at Grand Forks University from January 1893 to August 1948. ^ "Station Name: ND GRAND FORKS INTL AP". National Oceanic and Atmospheric Administration. Retrieved August 29, 2017. ^ a b c d e f "Profile of General Demographics: Grand Forks, North Dakota" (PDF). U.S. Census Bureau. Archived from the original (PDF) on June 27, 2007. Retrieved June 5, 2007. ^ U.S. Census Bureau. Census 2000, Summary File 1. "GCT-PH1. Population, Housing Units, Area, and Density: 2000 - County -- Subdivision and Place". American FactFinder. <http://factfinder2.census.gov>. Retrieved January 31, 2008. ^ "City of Grand Forks 2013 Comprehensive Annual Financial Report" (PDF). November 9, 2014. p. 199. Retrieved November 9, 2014. ^ "Contact". LM Glasfiber. Archived from the original on May 23, 2007. Retrieved June 5, 2007. ^ "Employment". Cirrus Design. Archived from the original on June 1, 2007. Retrieved June 5, 2007. ^ "Food Plants". J.R. Simplot Company. Archived from the original on September 28, 2007. Retrieved June 5, 2007. ^ "Dakota Datebook, October 30, 2006: State Mill & Elevator". North Dakota Public Radio. Archived from the original on September 30, 2007. Retrieved June 8, 2007. ^ "Locations". Amazon.com. Retrieved June 5, 2007. ^ "SEI". Archived from the original on February 1, 1997. Retrieved June 5, 2007. ^ "Hugo's". Retrieved June 5, 2007. ^ "Business Resources – Local and State Programs". The Grand Forks Region Economic Development Corporation. Archived from the original on June 30, 2007. Retrieved June 5, 2007. ^ "About us". Grand Forks Region Economic Development Corporation. Archived from the original on June 30, 2007. Retrieved June 11, 2007. ^ a b c d "Arts". Greater Grand Forks Convention & Visitors Bureau. Archived from the original on May 30, 2007. Retrieved June 11, 2007. ^ "Northern Valley Arts Council". Retrieved June 5, 2007. ^ "CulturePulse". CulturePulse.org. Retrieved June 11, 2007. ^ "NDMOA History". North Dakota Museum of Art. Archived from the original on August 13, 2007. Retrieved June 11, 2007. ^ "Burtness Theater". University of North Dakota. Archived from the original on October 18, 2007. Retrieved June 11, 2007. ^ "Greater Grand Forks Symphony Orchestra". Greater Grand Forks Symphony Orchestra. Retrieved June 11, 2007. ^ "North Dakota Ballet Company". North Dakota Ballet Company. Retrieved June 11, 2007. ^ "Empire Arts Center". Empire Arts Center. Retrieved June 11, 2007. ^ "Summer Performing Arts Company". Summer Performing Arts Company. Retrieved June 11, 2007. ^ "Myra Museum". Grand Forks County Historical Society. Archived from the original on July 5, 2007. Retrieved June 20, 2007. ^ "Frozen Four History". Inside College Hockey. Retrieved June 21, 2007. ^ "'Fighting Sioux' Name Prevents North Dakota From Playing Against Some Teams". The Chronicle. Retrieved June 21, 2007. 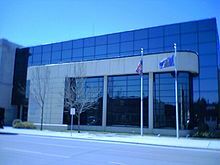 ^ "Grand Forks, North Dakota Alerus Center". Greater Grand Forks Convention & Visitors Bureau. Archived from the original on May 17, 2007. Retrieved June 5, 2007. ^ "Parks and Facilities". Grand Forks Park District. Archived from the original on July 2, 2007. Retrieved June 18, 2007. ^ "Grand Forks Golf Courses". Retrieved October 22, 2007. ^ "King's Walk Golf Course". Grand Forks Park District. Retrieved June 18, 2007. ^ "Lincoln Golf Course". Grand Forks Park District. Archived from the original on April 12, 2007. Retrieved June 18, 2007. ^ "Ray Richards Golf Course". University of North Dakota. Archived from the original on June 18, 2007. Retrieved June 18, 2007. ^ "Welcome". Grand Forks Country Club. Retrieved June 18, 2007. ^ "Course Directory". Minnesota Golf. Retrieved June 6, 2007. ^ "Manvel River's Edge Golf Course". Retrieved June 5, 2007. ^ "The Greenway". City of Grand Forks. Archived from the original on June 16, 2007. Retrieved June 18, 2007. ^ "Activities". Greater Grand Forks Convention & Visitors Bureau. Archived from the original on May 14, 2007. Retrieved June 6, 2007. ^ "Map of Grand Forks bike paths" (PDF). City of Grand Forks, North Dakota. Archived from the original (PDF) on July 17, 2011. Retrieved June 5, 2007. ^ "Grand Forks Herald". Grand Forks Herald. Retrieved June 18, 2007. ^ "Forum Communications buys Grand Forks Herald, Duluth News Tribune". Forum Communications. Archived from the original on September 27, 2007. Retrieved June 21, 2007. ^ "Exponent". The Exponent. Archived from the original on May 21, 2007. Retrieved June 18, 2007. ^ "The Dakota Student". The Dakota Student. Retrieved June 18, 2007. 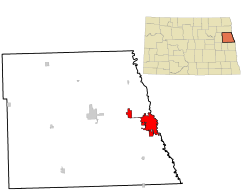 ^ "North Dakota – Radio Broadcasting Stations". RadioStationWorld. Archived from the original on December 21, 2007. Retrieved December 27, 2007. ^ "Grand Forks Arbitron Ratings". Radio and Records. Archived from the original on December 19, 2007. Retrieved June 5, 2007. ^ "WDAZ-TV". Forum Communications Company. Archived from the original on May 19, 2007. Retrieved June 18, 2007. ^ a b "City Council". City of Grand Forks, North Dakota. Archived from the original on October 30, 2006. Retrieved June 5, 2007. ^ "Mayor Brown". City of Grand Forks, North Dakota. Archived from the original on November 8, 2006. Retrieved June 5, 2007. ^ Tran, Tu-Uyen (April 13, 2010). "Council reform not quite new". Grand Forks Herald. ^ "About NCTC". Northland Community and Technical College. Retrieved June 14, 2007. ^ "About the GFPS". Grand Forks Public Schools. Archived from the original on September 27, 2007. Retrieved June 14, 2007. ^ "North Dakota Vision Services, Home Page". North Dakota Vision Services. Retrieved June 14, 2007. ^ "St. Michael's Elementary School". St. Michael's Elementary School. Archived from the original on April 23, 2007. Retrieved June 14, 2007. ^ "School". Holy Family Parish. Archived from the original on September 28, 2007. Retrieved June 14, 2007. ^ "School Information". Sacred Heart Catholic School. Retrieved June 14, 2007. ^ "RCS Home Page". Riverside Christian School. Archived from the original on August 29, 2007. Retrieved June 5, 2007. ^ "Airport Information". Grand Forks International Airport (GFK). Archived from the original on June 1, 2007. Retrieved June 5, 2007. ^ "Stations – Grand Forks, ND (GFK)". Amtrak. Archived from the original on February 6, 2007. Retrieved June 5, 2007. 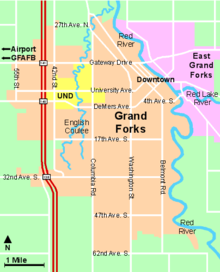 ^ a b "Map of Grand Forks, ND". MapQuest. Retrieved June 5, 2007. ^ "History of CAT" (PDF). City of Grand Forks, North Dakota. Archived from the original (PDF) on June 27, 2007. Retrieved June 5, 2007. ^ "Altru Quick Facts" (PDF). Altru Health System. Retrieved November 30, 2014. ^ "Sister Cities". City of Grand Forks. Archived from the original on November 8, 2006. Retrieved June 11, 2007. ^ Lee, Yangkyoung (May 2, 2007). "$5 million godsend". Grand Forks Herald. ^ Bakken, Ryan (October 21, 2003). "Japanese Residents Will Dedicate New Garden". Grand Forks Herald. ^ "GF's family gets smaller". Grand Forks Herald. February 19, 2006. ^ Davis, Lisa (October 19, 2003). "Sister city delegates visit GF". Grand Forks Herald. Archived from the original on September 27, 2007. Retrieved June 5, 2007. Tweton, Jerome D. (1986, reprinted 2005). Grand Forks, A Pictorial History, Norfolk, Virginia: The Donning Company. Bladow, Eldon (Ed., 1974). They Came To Stay, Grand Forks, North Dakota: Grand Forks Centennial Corporations. Jacobs, Mike (Ed., 1997). Come Hell and High Water, Grand Forks, North Dakota: Knight-Ridder. Wikivoyage has a travel guide for Grand Forks, North Dakota.